Behold- what I believe is the most detailed Railway Series Map there's ever been! 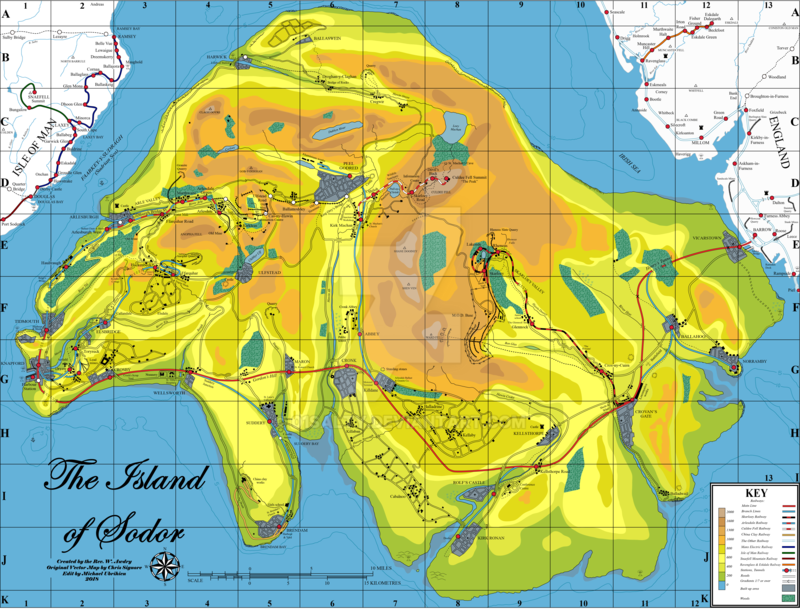 The map above started off as a digital vector map of the Clive Spong map seen in The New Collection book and elsewhere. 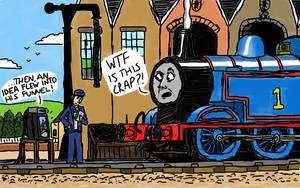 It was created by Christopher Signore of Sodor Island Forums for the purposes of the Extended Railway Series. - Mapping of historical locations (Old Suddery Wharf, the path of the E&KR tramway, the old Cronk & Harwick Railway etc), and of current elements mentioned in TIOS but somehow missed on the original map, such as the river that runs near Brendam, and Cas-Ny-Hawin mine. - Reworking of some locations, such as making the Ffarquhar Quarry tramway and Crovan's Gate wharf more detailed and accurate to other maps. - A comprehensive mapping of locations found on both the Isle of Man and Mainland England, including their railways. - Removal of certain kid-friendly descriptions from the original to make it look more like a real map. - Added other details such as a title and compass. Disclaimer- some of the locations mapped are based on speculation, so not all of them are to be taken as 100% canon or 'truth'. For example the orientation of the Brendam river, and the locations of the Glennock Junior School and Rheneas Slate Quarry are educated guesses, but we don't know for certain. I've also since printed this map and had it framed and hung on a wall in my house. I've wanted a physical Sodor map for so long, so I'm pleased as punch to finally have one! I might upload a photo of the framed map too, following this. I hope you enjoy it If you have any questions or thoughts on it, let me know! 01Salty are you going to do a tvs version? I did try to do one once upon a time, but the TV Series continuity is so inconsistent it's practically impossible to make a 100% accurate one! I might give it another try one day though. An ambitious undertaking, and it paid off in the end. I suppose the only one who could feasibly verify some of the more conjectural element on this map, the Thin Clergyman's son, is unavailable for contact? And yeah, as far as I know Christopher Awdry can't be easily contacted. Wow thats great (and easier to find other locations) do you have a link to the ers version? Thanks! I don't think the ERS team have publicly published the ERS map yet, so I can't provide any link sorry. which program do you use? or do you draw it? I believe the guy who made the original digital map used Photoshop. I used Paint.Net to edit it. Stupid question: I presume the height legend is in feet? Well, this is so much better than the old maps that I have. Without a doubt, this has to be the best version of the map out there. Oh, to import this map into a train simulator! Is there a high resolution version somewhere? I want to look closer at the details. Click on the map twice. Wrong person to ask, but not sure. Impressive work & nice that others can have a hq copy now too. It is beautiful mate. When you have a ton of locations to catch up with fully illustrated on the show, it's kind of hard to recall if there were these smaller locations from the books e.g. The Garth, Rolf's Castle Conference Centre. 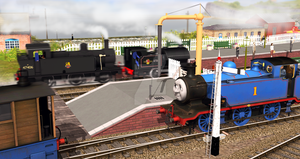 I wish for all this in trainz.